We have a nice Yu-Gi-Oh! Prize package to offer to the winner, based on popular vote, of a written review of the New Yu-Gi-Oh! 3D film in theaters on Feb 26 – 27th, 2011 and March 5 – 6th, 2011. Many will enter, only one will win. Simply go see the movie in a theater near you on Feb 26 & 27th, 2011 and March 5 & 6th, 2011, and write a serious OR funny and entertaining review of at least 3 paragraphs. Your review must cover the basic plot, what you liked or didn’t like about it, and the characters.. again what you liked or didn’t like about them and etc. Our staff will pick the top 2 from each ‘style’ (serious, funny) and post them to a public poll where you can vote. The top voted review will win! Write your review in your favorite word processor, text editor, or email client. 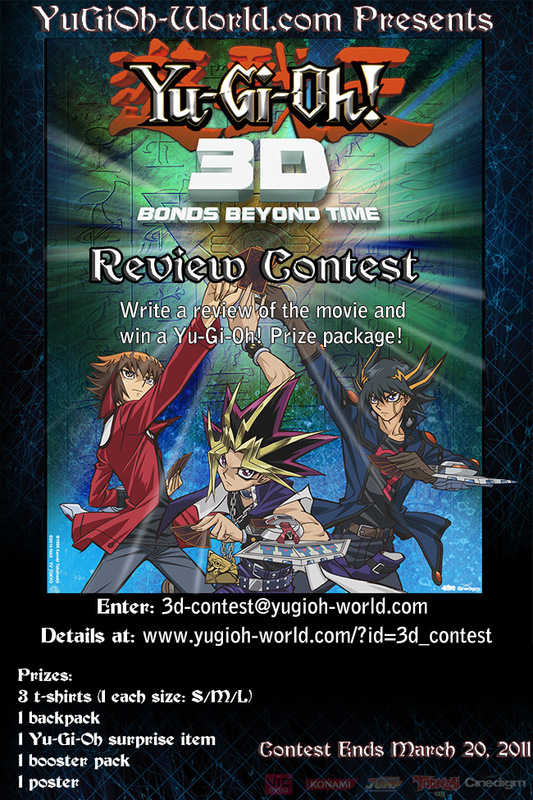 Attach and/or send by email to 3d_contest @ yugioh-world.com before midnight PST March 20, 2011. We will notify you that your entry was received and again IF you are the winner. You must supply current and correct contact information and a working email address to win a prize. Contest is over.. see the winner below..
CLICK HERE to locate a theater near you. All submissions will be judged first by our staff, who’s decision is final, then by the general public. One vote per IP/household in the final poll. In the event of a tie, our staff will randomly pick a winner from the pool of tied entrants. This decision is final. If a prize winner can not accept a prize, it will be awarded to the runner up. You hereby give permission to use your review and/or likeness on the website for promotional or other reasons. (we do not share data with 3rd parties). Rules subject to change based on Prize Vendor’s requirements. All review submissions must be received by midnight PST March 20, 2011 to be considered. David E, aka Dollow Rlance, of Moreno Valley, Ca. submitted the best review (and the only proper submission) and is declared the winner. 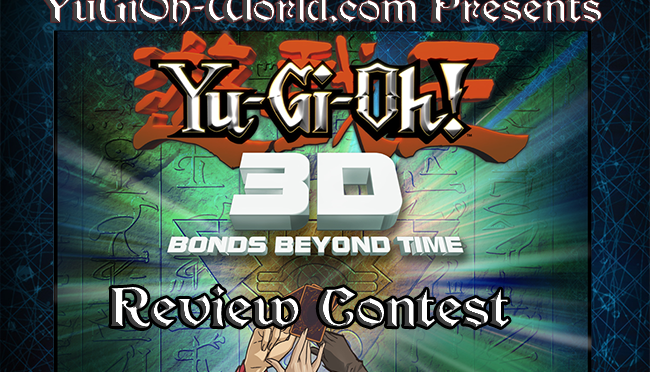 Dollow Rlance gets a neat YGO3D prize package that includes 3 t-shirts (1 each size: S/M/L), 1 backpack, 1 Yu-Gi-Oh surprise item, 1 booster pack, 1 poster, and his review posted on the movie’s page. Winning Review posted on our movie review webpage with prominent credit for writing and winning contest. Prizes will be shipped from the sponsor directly to the winner and are subject to change or be substituted for like items. © 2010 4Kids Entertainment, Inc. All Rights Reserved.